1 Designing your kitchen or bath is FUN! When we first sit down with you, we want to know what your ideas are, how you want to live in your space, what your current layout or cabinet design is lacking… all so we understand how to best service your needs! 2 From simply adding a spice rack, pull-out shelves or trash bin – to changing walls and re-configuring spaces for a completely new kitchen or bath (we do offices, closets and garages too! ), we consider your ideas and budget, add in our recommendations, to come up with a fresh, new living space for you. 3 To start the design process, we take detailed measurements and pictures of the existing space. Whether you are here full-time, part-time or planning to move here, we communicate with you by phone and email with design ideas, questions and layouts. For new construction, we will work closely and smoothly with your contractor. How much do you cook? Do you work with others in your kitchen? Do you entertain while you are preparing a meal in your kitchen? Show me what you cook with – so we can be sure to create easy storage places for it. 4 The selection process is then started with you so we can begin pricing. We pay close attention to your budget constraints. We try to offer more than one option for your comparison and choice. We have a reputation for honest, fair pricing and building great relationships with our customers. 5 The building phase is planned for minimal disruption to your home or office, especially if you are in it at the time! Cabinetry is ordered and built in our warehouse, appliances, sinks and fixtures are delivered to you. Our aim is to do the work in your home or office quickly and smoothly, without lengthy wait-times. Again, we keep you apprised of the job progress by phone, email and pictures. We give you the personal attention you deserve from project start to finish and years after because you are now part of our family! Providing unparalleled quality and craftsmanship is standard practice at Reliable Cabinet Designs. 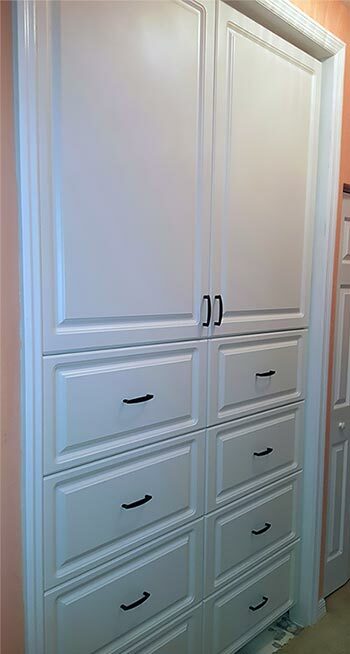 We offer only the finest economy, premium and custom grade cabinets available. Visit our Design Center to see for yourself!